The purpose of this study is to determine the validity and reliability of original version of the life-long learning scale developed by Wielkiewicz & Meuwissen (2014) in Turkey conditions. Experts and researcher made translation of the scale into Turkish. Then, experts in terms of consistency, content and measurement issues also analyzed the scale. Revised version of the scale was administered to 727 university students to determine its validity and reliability. The instrument consists of only one dimension. The instrument consists of 15 items. Reliability analysis of the instrument revealed Cronbach-Alpha coefficients of 0,93 for the generation of the instrument. These results showed that the lifelong learning scale can be used in Turkey. Anderson, J.C. ve Gerbing D.W. (1984). The effect of sampling error on convergence, impro-per solutions, and goodness‐of‐fit indices for maximum likelihood comfirmatory factor analy-sis. Psychometrika, 49, 155‐173. Beycioglu, K., Konan, N. 2008. Yaşam Boyu Öğrenme Ve Avrupa Eğitim Politikaları. Elektro-nik Sosyal Bilimler Dergisi, 24,369-382. Bryce, J. (2006). Schools and lifelong learners. In J. Chapman, P. Cartwright & E.J. McGilp (Eds. ), Lifelong learning, participation and equity .(pp. 243-263),Dordrecht: Springer. Büyüköztürk, Ş. (2000).SPSS uygulamalı bilgisayardestekli istatistik öğretiminin istatistiğe yönelik tutumlara ve istatistik başarısına etkisi. EğitimAraştırmalarıDergisi, 1, 13-20. Cobern, W.W.(2015), The Lifelong Learning of Science, International Journal on Lifelong Education and Leadership, 1(1), 1-10. Cole, D.A. (1987). Utility of confirmatory factor analysis in test validation research. Journal of Consulting and Clinical Psychology, 55, 1019‐1031. Commission of the European Communities (2000). A Memorandum on Lifelong Learning. Brussels. http://arhiv.acs.si/dokumenti/Memorandum_on_Lifelong_Learning.pdf (29 Mayıs 2016’ da erişildi). Cornford, I. (1996). The defining attributes of 'skill' and 'skilled performance': Some implicati-ons for training, learning and program development. Australian and New Zealand Journal of Vocational Education Research, 4 (2), 1-25. Dehmell, A. (2006). Making a European area of lifelong learning a reality? Some critical reflec-tions on the European Union’s lifelong learning policies. Comparative Education, 42 (1), 49-62. Dindar, H., Bayraktar, M. (2015). Factors Effecting Students’ Lifelong Learning in Higher Education, International Journal on Lifelong Education and Leadership, 1(1), 11-20. Dinevski, D., & Dinevski, I. V. (2004). The concepts of university lifelong learning provision in Europe. Transition Studies Review, 11 (3), 227-235. Dong, W. (2004). Improving Students’ Lifelong Learning Skills in Circuit Analysis. The China Papers. Evers, F. T., Rush J. C., and Berdrow I. (1998). The Bases of Competence: Skills for Lifelong Learning and Employability. San Francisco: Jossey-Bass. Gable, R. K.,& Wolf, M. B. (1993).Instrument Development in the Affective Domain: Measu-ring Attitudes and Values in Corporate and School Settings (2nd Ed.). Boston, MA: Kluwer Academic Publishers. Gencel İ.E. (2013) Öğretmen Adaylarının Yaşam Boyu Öğrenme Yeterliklerine Yönelik Algıla-rı, Eğitim ve Bilim, 38(170):237-252. Hu, L, ‐T., ve Bentler, P.M. (1999). Cut‐off criteria for fit indexes in covariance structure analy-sis: Conventional criteria versus new alternatives. Structural Equation Modeling, 6, 1‐55. Jöroskog, K.G. ve Sörbom, D. (1986). Lirsel VI: Analysis of linear structural relationships by maximum likelihood, instrumental variables, and least squares methods. Mooresville, IN: Sci-entific Software. Karakuş, C. (2013). Meslek yüksekokulu öğrencilerinin yaşam boyu öğrenme yeterlikleri. Eğitim ve Öğretim Araştırmaları Dergisi, 2 (3), 26-35. Knapper, C. and Cropley, A. J. (2000). Lifelong Learning in Higher Education . London: Kogan Page. Kozikoglu, I. (2014), Üniversite ve Meslek Yüksekokulu Öğrencilerinin Yaşam Boyu Öğrenme Yeterliklerinin İncelenmesi, Journal of Instructional Technologies & Teacher Education, 3(3), 29-43. Kulich, J. (1982) Lifelong Education And The Universities: A Canadian Perspective. Internatio-nal Journal of Lifelong Education, 1(2), 123–142. Lambeir, B. 2005. Education as liberation: The politics and techniques of lifelong learning, Educational Philosophy and Theory, 37(3): 350. Læssøe, J., Schnack, K., Breiting, S., Rolls, S.(2009). Climate Change and Sustainable Deve-lopment: the Response from Education. A cross-national report from international alliance of leading education institutes. The Danish School of Education, Aarhus University. Marsh, H.W. ve Hocevar, D. (1988). A new more powerful approach to multitrait‐multimethod analyses: Application of second‐order confirmatory factor analysis. Journal of Applied Psyc-hology, 73 107‐117. Marsh, H.W., Balla, J.R., ve McDonald, R.P.(1988). Goodness‐of‐fit indexes in confirmatory factor analysis: The effect of sample size. Psychological Bulletin, 103, 391‐410. Mercimek, O. & Pektaş, M. (2013). İstatistiğe yönelik öz-yeterlik ölçeğinin geliştirilmesi. 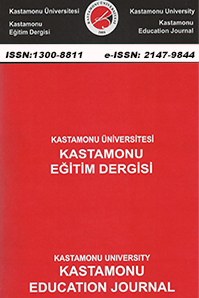 Kas-tamonu Eğitim Dergisi, 21(2), 759-776. Ouane, A. (2002). Adult learning: emerging issues and lessons to be learned. In M. Singh (Ed). Institutionalising Lifelong Learning: Creating Conducive Envi-ronments for Adult Learning in the Asian. UNESCO Institue for Educa-tion.Context, 17-22. Pett M. A., Lackey N. R.,& Sullivan J. J.. (2003). Making sense of factor analysis: The use of factor analysis for instrument development in health care research (Illustrated Edition). Sage. Wain, K. (2000). The learning society: postmodern politics. International Journal of Lifelong Education, 19 (1), 36-53. White, J.P. (1982). The aims of education re-stated. London: Routledge & Kegan Paul. ISNAD ENGİN, Melih , KÖR, Hakan , ERBAY, Hasan . "Yaşam Boyu Öğrenme Ölçeği Türkçe Uyarlama Çalışması". Kastamonu Eğitim Dergisi 25 / 4 (July 2017): 1561-1572.